The 01-Aug-2012 launch of AirAsia Japan, a joint-venture between Malaysia's AirAsia and Japan's All Nippon Airways (ANA) represents more than simply another step in the LCC revolution in Japan. The phenomenon is also rapidly spilling over to neighbouring countries. Almost as transformational will be the long-term affect on ANA of having exposure to the AirAsia group, a marriage of two of aviation's lucrative talents: the at times far-sighted talent of ANA and the implementation agility of AirAsia. Although starting small, AirAsia CEO Tony Fernandes sniffs a very big upside and it will be no surprise to see new routes and new aircraft added at a faster rate than published. That results in AirAsia giving a much-needed internationalisation push to ANA, marking the overdue start of a new competitive era for North Asia's legacy carriers. Similar regional relationships are emerging between China Eastern and Jetstar, as well as China Southern with Air France-KLM. The upside is not without significant challenges to ANA. The market is as exciting as it is worrying. AirAsia Japan is not going to be a quiet partner. AirAsia Japan on 01-Aug-2012 launches double daily service from Tokyo Narita to Fukuoka and triple daily service to Sapporo from Tokyo Narita. On 03-Aug-2012 it expands its network with a daily service between Tokyo Narita and Naha (Okinawa), giving the carrier a considerably more innocuous start than Peach's 01-Mar-2012 or Jetstar Japan's 03-Jul-2012 launch, although the LCC movement in Japan is still young. 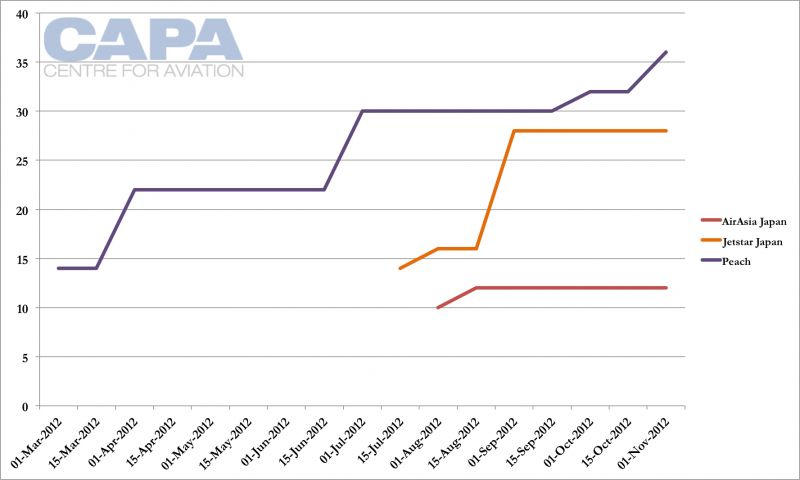 With all three carriers operating A320s in a single-class 180-seat configuration, the densest the aircraft is certified for, available seats in these graphs corresponds to daily departures. So far, Peach is the only one of the three new LCCs to serve international routes. 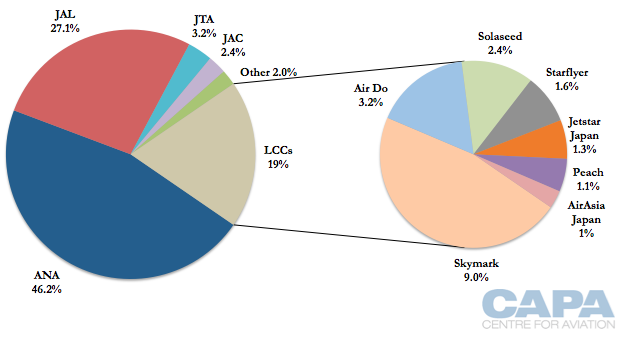 While it deploys more seats across its network than Jetstar Japan, Jetstar Japan has the largest market share of the new LCCs, but this is still only 1.3%, although the figure will grow. 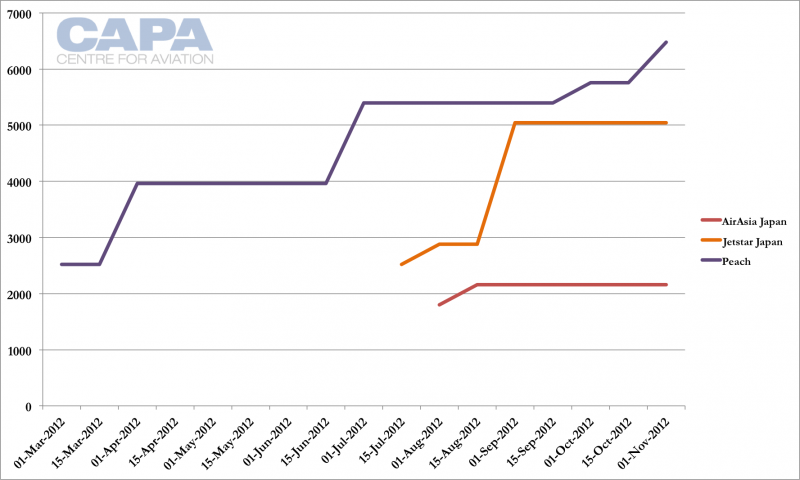 By Oct-2012, Japanese LCCs will hold 19% of capacity, representing astonishing growth. They are on track to hold possibly 50% by the end of the decade. AirAsia Japan had filed schedules to offer two daily services to South Korea from 01-Oct-2012: a single flight from Narita to Busan and a single flight from Narita to Seoul Incheon, but these services have not yet been announced or loaded in the carrier's reservation system. AirAsia Japan also filed to initially have four daily return flights to Sapporo but will only have three daily return flights for the time being. South Korea is the largest market from Japan and all three of the new LCCs are expected to have significant capacity into the country. Peach, with double daily services, is even promoting same-day shopping trips – a concept that just a year ago would have seemed no more than a dream, given the absence of low fares. This type of new tourism opens the door to a whole new world of travel for the North Asian countries. The swelling of the LCC penetration rate will not occur without incumbent carriers – ANA and Japan Airlines (JAL), but also Skymark – making sweeping changes to their business models. While they plan to shift growth to international flights and make other network changes, these will not compensate for the huge influence the LCCs will have as they expand. Also exposed is Japan's larger transport system, as well as the influence the LCCs will have on other regions to liberalise and support no-frills carriers, placing stress on those countries' incumbent carriers. Taiwanese airlines, for example, still appear to be blissfully oblivious to the impact these new entrants can have, especially now that an open skies agreement has been signed between Japan and Taiwan. As much as AirAsia Japan will benefit ANA, ANA really had little choice but to become a joint-venture partner. Prior to the Aug-2011 AirAsia-ANA JV, ANA was well into planning another JV LCC, Peach Aviation. JAL was expected to partner with Jetstar via its oneworld links with Qantas, leaving AirAsia to explore options with other Japanese carriers – namely Skymark. As it became apparent, AirAsia had conviction and would enter the Japanese domestic market in one form or another, ANA hastily elected to partner with AirAsia, creating a second LCC whose impact it could control rather than face an unaffiliated AirAsia Japan with relatively free rein. The JV led to the convoluted arrangement of having Peach initially launch from Osaka Kansai and AirAsia Japan from Tokyo Narita, fragmenting ANA's LCC approach compared to JAL, whose LCC JV, Jetstar Japan, started with a base at Tokyo Narita and a smaller one at Osaka Kansai. Without AirAsia Japan, ANA risked restricting Peach to Osaka Kansai rather than tapping the larger Tokyo area. ANA held the view that the Kinki (or Kansai) region that encompasses Osaka is more price-sensitive than the Tokyo area owing to the lower emphasis on financial services, a conclusion it reached based on its international flights operated out of Osaka compared to Tokyo. ANA in the latter half of the past decade had been tempted to limit LCC exposure in Tokyo in order to preserve its core business in the country's largest metropolitan area; this was a reverse of thought from the early 2000s to establish a LCC at prized downtown airport Tokyo Haneda. Shunning Tokyo would have handed competitors, and Jetstar Japan in particular, the low-cost market from Tokyo, which the other carriers would have likely stitched up. AirAsia Japan forces ANA into the Tokyo market, a necessary move even if it leads to fragmentation within ANA's LCC strategy. AirAsia is also the only effective competition to Jetstar for a multitude of reasons including a pan-Asian network, brand awareness, operational experience, favorable aircraft lease and acquisition rates and – the heart of an effective LCC – savvy IT and developed ancillary revenue streams. The foundation of a LCC is of course a low cost base, and as Peach took shape under the eyes of ANA managers used to full-service operations, it became apparent that Peach was making compromises on its cost base. 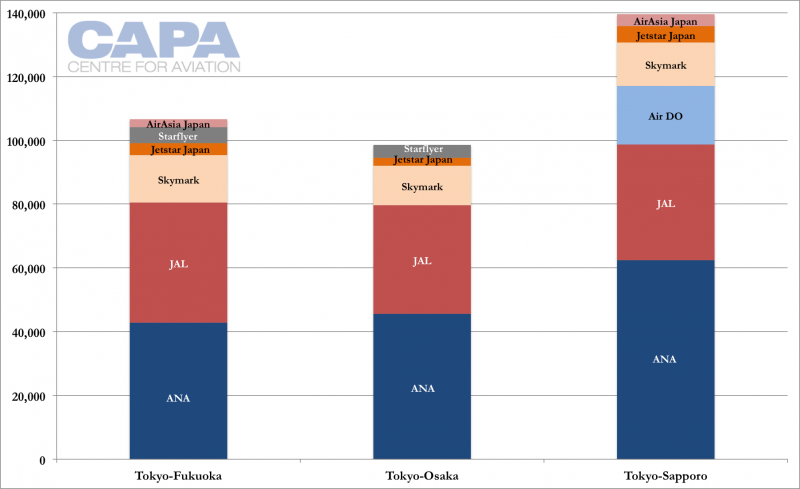 ANA projects AirAsia Japan to achieve a cost per available seat kilometre (CASK) of JPY6 (USD7.67 cents) in FY2013 or FY2014, depending on how quickly scale is amassed. That is half the CASK of stated figures from ANA and JAL – which are flattered by long-haul operations. On a point-to-point comparison the LCCs will be even more cost effective. In comparison, JAL in FY2011 had a CASK of JPY11.5 (USD14.70 cents) and ANA JPY13.4 (USD17.14 cents). JAL is working to achieve a CASK of JPY11.0 (USD14.07 cents) in FY2016 while ANA has a cost reduction programme to bring its CASK down to JPY12.4 (USD15.86 cents) by FY2015. ANA's on-again, off-again relationship with a Tokyo-based LCC exemplifies a broader issue for the carrier. This is one that comes from growing up in a highly conservative and protected home market. Adjusting product and cost-effective strategy to adapt to a whole new environment will take time. ANA can have immense foresight but often lacks the focus to achieve an objective. ANA first started seriously considering a LCC in 2004 but it was not until Sep-2010 that a carrier took form, and even then launched after 18 months, with a relatively high cost base, compared to the lower-cost LCCs AirAsia Japan and Jetstar Japan that launched within a year of formation, although ANA's Peach was the first to market, beating any effort from JAL. ANA's foresight shows in other areas: it pushed Boeing for a medium-capacity long-haul aircraft (which became the 787) while other carriers spoke of the A380 and as Boeing later dropped the Sonic Cruiser. Yet, showing ANA's implementation inexperience, especially internationally, ANA had a small long-haul network and premium products that were perhaps satisfactory but not cutting edge. Likewise, ANA saw the early need for technology as part of the passenger experience, but when introduced it came at a high cost and with clunky and user-unfriendly systems; even today, it maintains separate domestic and international reservation systems. In the latest example, ANA is examining a long-term option to invest, form or acquire a foreign carrier as a new source of growth if Japan's shrinking population and economy cannot be stimulated with LCCs and increase in international flights, but this strategy is immensely broad and its implementation will not be straightforward. The long incubation period leading up to 2012's LCC subsidiaries offers some insights into the difficulties the carrier faces in adapting in a new environment. At the highest levels there was an awareness of what was needed; equally it would appear the new strategies ran into headwinds once it came to making the necessary internal moves. Even today there are strong signs of internal reluctance to embrace the new offspring. 25-Mar-2004 First reports surface that ANA is planning to establish a subsidiary by late 2004 to operate low-cost services with four or five 737s, based at Fukuoka, operating to regional airports in Japan. ANA was to establish a preparatory office at Air Nippon by Apr-2004 for the new company. 07-Jun-2004 ANA announced plans to launch a low-cost arm by spring 2005, mainly using 737s, though ANA stated other aircraft could be added to the fleet. Talks with pilots' union were said to be “proceeding smoothly”. 06-Aug-2004 The proposed LCC gets a name, “Air Next”, to be based at the Southwestern island of Kyushu. Services with two Air Nippon 737-500s were to commence in Jun-2005, rising to 100 flights per day by 2007. 01-Oct-2004 Further Air Next details confirmed – to operate domestic routes from Fukuoka or Okinawa currently served by Air Nippon. Fleet expected to rise to seven aircraft by the end of 2008. ANA president Mineo Yamamoto stated ANA will launch an LCC “before 2009” under its own name. Indicates the carrier will be based at Tokyo Haneda Airport. ANA: "What has happened to US airlines might be repeated in Japan if we fail to offer low-cost fares to compete with such newcomers in the industry," Mineo Yamamoto, president. Source: Nikkei, 25-Jan-2006. ANA stated it may establish a new domestic LCC and separate international carrier, or one carrier for both markets. ANA is also considering restructuring an existing subsidiary airline “to better compete with cheaper overseas airlines”. ANA: “In 2009, competition will increase and low-cost carriers, particularly from elsewhere in Asia, will start flying into Tokyo. We have to be well prepared for it,” Mineo Yamamoto, president. Source: Financial Times, 14-May-2006. 09-Sep-2006 ANA confirmed it is considering launching two LCCs – one for domestic services and one for international services – by 1H07. The new carriers would be launched as subsidiaries of ANA and would charge lower fares by significantly cutting the costs of in-flight services. ANA stated it is considering establishing an LCC “to serve Asia”, with a decision to be made by 2010. ANA: “The cost structure of Asian [budget] airlines is half that of ours. We are considering creating a low-cost company to serve Asia, because if one of them were set up in China it would pose a big threat to ANA…. We can take advantage of the wait [for the completion of the runway expansions at Tokyo] to study the creation of a low-cost company and decide whether to launch one or not,” Mineo Yamamoto, president and CEO. Source: AFP, 31-May-2006. ANA announces plans to launch an Asian LCC in the 2008/09 financial year. The airline could be established under a JV with another Asian airline, although acquiring another firm is also an option. ANA is to set up an office in Hong Kong from Apr-2008 to “conduct market research and explore possibilities”. ANA: "We are seriously examining the market and the likelihood of low-cost carriers flying into Haneda after it gets its fourth runway in October 2010, and how we will take them on if they do. Setting up an airline from scratch is an option, as is acquiring a new one, or possibly setting up a joint venture. We are seriously looking at the options now,” Rob Henderson, spokesman. Source: Thomson Financial, 26-Mar-2008. ANA and Hong Kong's First Eastern Investment Group sign MoU to establish Osaka Kansai-based LCC serving domestic and international routes. ANA: “Regardless of the intense competition in the air transportation industry, we anticipate an increase in passenger traffic demand in East Asia and came to the conclusion that a low-cost carrier would be the right approach to compete effectively in this market,” Shinichiro Ito, CEO. Source: Company statement, 09-Sep-2010. 01-Feb-2011 ANA announces a firm partnership with Hong Kong's First Eastern Investment Group to establish Osaka-Kansai based LCC, A&F Aviation, to commence operations in Oct-2011. 27-May-2011 "Peach" brand is unveiled. Launch date is pushed back to Mar-2012. AirAsia and ANA announce JV AirAsia Japan, to fly in Aug-2012. ANA and AirAsia: "In Japan, the aviation market is undergoing rapid transformation.... Narita airport, a major international hub serving Tokyo, is seeking to increase capacity with the introduction of a new terminal and is expected to attract many low-cost carriers and foreign airlines. ANA has been seeking opportunities to launch a new low-cost business based at Narita and, after analysis, has concluded that partnering with an existing low-cost carrier is the most efficient and strategically advantageous option...AirAsia has been seeking a business partner with strong Japanese market influence to further expand its scope." Source: Company statement, 21-Jul-2011. 01-Mar-2012 Peach commences operations 18 months after MoU announcement. 01-Aug-2012 AirAsia Japan commences operations 12 months after formation. But an unexpected consequence is the fundamental shift North Asian LCCs will bring to the top-level strategy of full service carriers. ANA, in considering long-term plans to find new markets under its brand or others, looks squarely at the AirAsia group. "What AirAsia is doing – they're a LCC and we're a full-service carrier, so very different. But AirAsia is expanding their base. AirAsia is expanding their brand. So in the same story it can be imagined if for instance in the long-term it's not wise to stay in domestic Japan, we have to go outside," ANA VP for corporate planning and AirAsia Japan board member Junichiro Miyagawa tells CAPA in Tokyo. The opportunity for a full service carrier to learn from a LCC is at the heart of the China Eastern-Jetstar JV to establish a Jetstar subsidiary in Hong Kong, Jetstar Hong Kong. While Jetstar has its desired outcomes, it lacks a local partner in Hong Kong, which China Eastern fulfils. While China Eastern will see other benefits, its primary interest is academic: to learn the LCC model to eventually establish its own LCC in mainland China, expected by the end of the decade. This will not be a full service and LCC partnership, but China Southern is understood to be learning immensely from the Air France-KLM Group, with a particular focus on developing and hubbing sixth-freedom traffic. The theme is that North Asian carriers, despite long-haul networks, lacked internationalisation, so profits were limited as a result. Basic strategies of connecting traffic with appropriate fares, adjusting demand and efficiently using IT can easily be remiss. Insight into and having what passengers require on long-haul journeys can be lacking. In contrast, Southeast Asian carriers have achieved greater internationalisation – Singapore Airlines and Thai Airways are the go-to examples – as they have relied on delivering high quality for sixth freedom traffic far longer and have been advantaged with lower costs bases. The North Asian carriers are turning to partners, and where an LCC is available, that carrier is often the savviest. A full service carrier learning from a LCC, especially a wholly owned subsidiary or unit, is not unheard of. Examples are plenty from last decade when North American carriers, despite shutting down their LCC spin-offs, incorporated elements of the subsidiary into the mainline fleet: personal televisions on Song were brought to Delta and Tango's fare structure was incorporated into Air Canada. Qantas has become more efficient, often learning from its Jetstar subsidiary, which gives rise to turns of phrase like the "Jetstarisation" of Qantas. But never have LCCs had such a large impact on the fundamental air transport business – not amenities or fare structures but its general direction. This trend will continue as North Asian legacy carriers, the sleeping giants, wake up to what LCCs have already achieved in their backyard, and also as these legacy carriers likely form JVs with the established LCC brands. South Korea and Taiwan, legacy carrier holdouts, are also ripe markets in due course for no-frills joint venture LCCs. The longer they delay, the more difficult it becomes to adapt. Now that Japan has moved, with LCCs and open skies agreements, things are going to change very fast. The medium-term effect of legacy carriers learning from LCCs – and especially in a JV, where the books and systems are open for inspection – is to deliver more intense competition. Legacy carriers will learn from LCCs and adopt smarter practices, forcing the LCCs to be even more lean. The market in Asia is still young but with a framework of the major players being established. In this rubric the focus on such legacy-LCC partnerships may be limited to the medium-term. The long-term poses a quandary. ANA, for example, may learn from AirAsia Japan and bring its LCC, Peach, into new markets that AirAsia where might otherwise try to establish itself. China Eastern's JV with Jetstar may give it the knowledge to establish a domestic mainland Chinese LCC and then lock out or limit Jetstar from a future domestic subsidiary. For now the battle is on the foreseeable future. The long term is for tomorrow and will likely take many twists and turns. Finally, amid the celebration of new carriers, and their tremendous impact on the market, it must be remembered that knowledge is empowering and that today's partner could be tomorrow's competitor. The reverse is also true. This is one in a series of analysis reports on the rapidly expanding LCC market in North Asia ahead of CAPA's Low-Cost Carriers in North Asia conference to be held in Macau in September. For more information see: LCCs in North Asia – CAPA Knowledge Event.